If you are reading this article, you most likely know about the amazing physical benefits that the practice of yoga brings to children. I would like to share some of my stories about the spiritual benefits that yoga brings to children. I have been working in early childhood for over thirty years and have been integrating the practice of yoga into my classroom, as well as holding after school classes for the last seven years. Since I am the children’s classroom teacher I am reminded daily of the empathy that yoga can bring to children. If there is a physical or emotional problem between two children, I can usually help them turn it around by suggesting that they take three deep yoga breaths. Once they calm down and tell their side of the story, we can brainstorm based on the question “ were you acting in the yoga way?” Surprisingly, they almost always understand and say “no” if they were the aggressor. If I then say “what would be the yoga way of solving this problem?” They can usually come up with some good answers. Does this mean they will never grab another toy away from someone? No, but it seems to help them understand that they can breath before they act and think of how their actions might effect someone else. I find this very helpful and wish I’d been exposed to it when I was five. A number of years ago my nephew was killed in a car accident. Because I was absent for some time I needed to share this information with my preschool and yoga classes. For many of the children in my classes, my nephew’s death was the first time someone they cared for was grieving. For others, it brought up a memory of a lost grandparent or a pet. We had many discussions about this in class, all of which seemed quite profound and sensitive to me. But the most meaningful moments were and still are from the children who came up to me quietly and ask questions like “Teacher Judy are you still sad?” As adults, we forget that grief remains long after the last sympathy card. I have learned from these children to check in frequently with people who may be suffering from any type of loss. This is a conversation I had with Paige. “Teacher Judy, are you a boy or a girl?” “ I am a girl” “I thought so!” said Paige with glee. “How did youcknow?” asks Judy, somewhat worried about the answer. “Oh” replied Paige, “Iccould tell because you are wearing a bracelet” “Hum” what did I learn from Paige? I think, never make assumptions without verifying them. We had a visitor in one of the classes. I introduced her to the children and ask them to answer questions if she had any for them. Then I ask them what they could do to show their best yoga manners. “I know!” said Preston. “We shouldn’t say potty words!” The rest of the class solemnly agreed. This lesson is clear; never use potty words when you have guests. My apologies to all of my relatives who have come to visit. The children seemed to accept this and one after another suggested where the best place to meditate might be. Their suggestions ranged from a quiet beach, your room, a desert, or heaven. The discussion then turned to heaven and if there is one or not, and if so can you mediate if you are dead. It was getting close to the end of class, so I told them it was time for Savasana (or Yoga Nap as some of the younger students call it). One of the children asked if they could sit in meditation pose instead of lying down. I said yes and many of them sat in full or half lotus for at least five minutes. This is a very difficult thing to do. This is what I learned: Children are very wise. Take time to listen to them and to meditate. At the end of most children’s classes we sing the “Shanti” or peace song. If I forget the kids always remind me. After that I usually close with a prayer of sorts like, “may all the children of the world have a school to go to.” Right after the Haitian earthquake, I started to close class by saying “Namaste”, when Nathan asked if he could say something. I said yes and he said, “May all the children of Haiti have enough food and clean water to drink.” I already new this, but children are very kind. I am entering a new stage in my life and very soon will become a partner in a yoga studio. 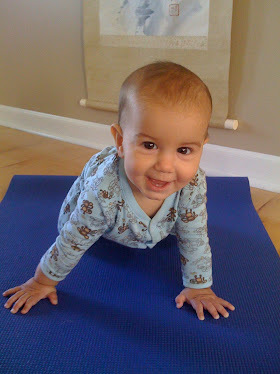 I will teach many types of classes, but I know that kid’s yoga will always be the place I learn the most. I look forward to getting to spend the rest of my life hanging out with such wise people.